Please note: The ring in the photos is sold. Your ring will be custom made to order for you. 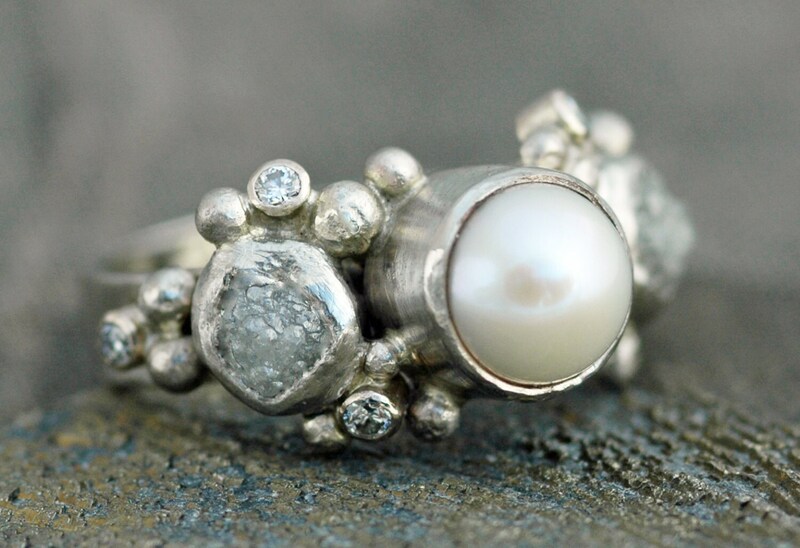 This listing is for a custom-made rough diamond and pearl engagement band. 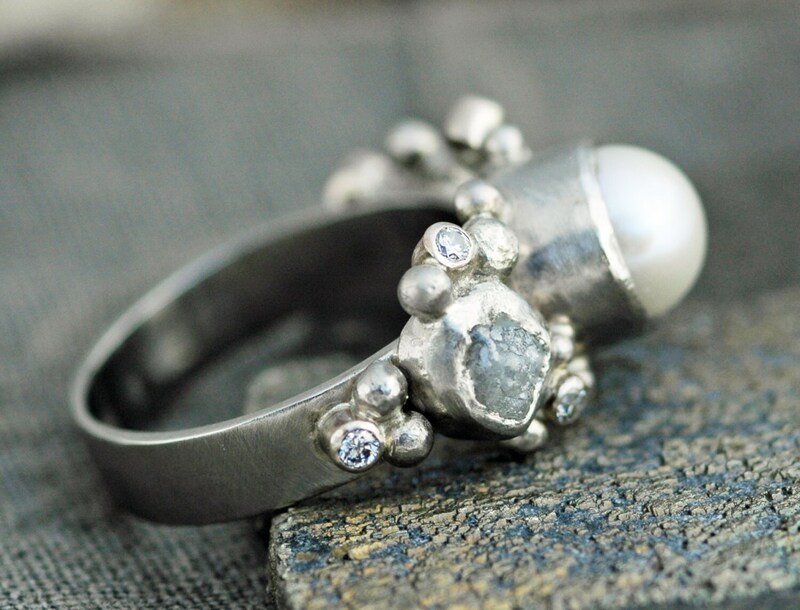 This ring is designed around two rough diamonds, white melee diamonds, and a freshwater pearl. The ring will be custom made for you upon ordering, and is completely customizable. Please note that the rings in the photos is sold- the images are used to give you an idea of what your ring will look like. Diamonds: The two rough diamonds are in their raw, natural crystalline form. These diamonds are conflict-free. They average 3.5-4.5mm across, and come in a variety of white, translucent, pale silver-gray to dark, glistening gray. Each one is completely unique, and equally compelling. If you have a specific request for diamond tone, let me know, and I will try to fulfill your request. Otherwise, I will choose the loveliest of the lot for your ring. The rough diamonds shown in the photograph are translucent, but are showing silver due to the overcast skies under which they were photographed. Studded around the rough diamonds are a series of six VS1 melee diamonds. These little faceted rocks are approximately 1.7mm across. More melee can be added- please get in touch for a cost estimate on using more stones. 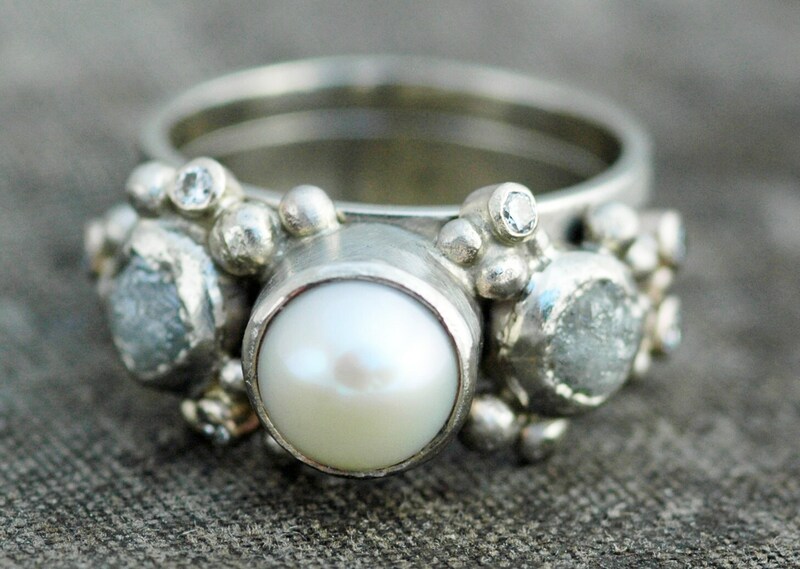 Pearl: The pearl is freshwater, and is imported directly from the pearl farmer. Please choose your pearl colour from those shown in the final picture. If you are interested in a different colour, let me know, and I will track one down for you. The lighter coloured pearls are in their natural state- these are the lovely colours in which they formed. The darker pearls, like most dark pearls, have been treated to create their colour. Not shown here, but also in the studio, are dark coppery black, natural copper coloured, and chartreuse green pearls. The pearls are around the 6-7mm range. I do have some of these pearls in the 8mm range, if you would like a larger one. Just let me know. Band Texture: The band is 4mm wide x 1mm thick recycled gold. All of the elements of the ring are solid gold. I can also make this ring in 10k or 18k gold, in white, yellow, or rose gold. 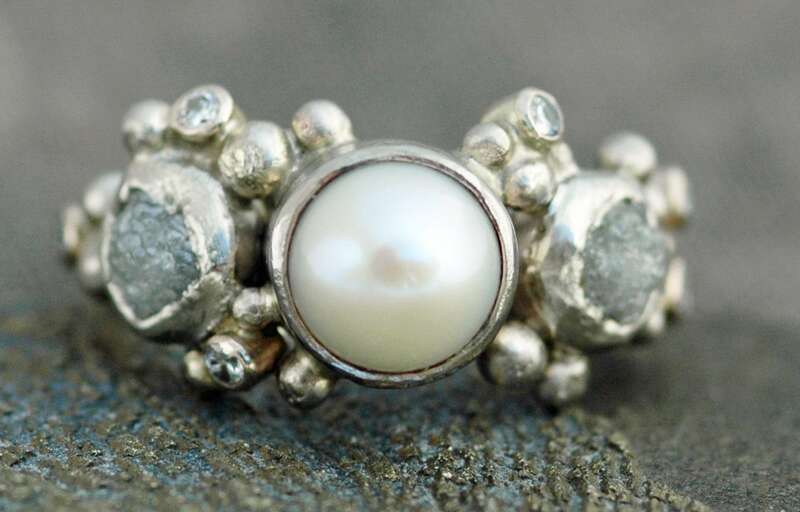 It can be given any texture you see in this listing: http://www.etsy.com/listing/58643323/textured-sterling-silver-band-custom Please leave your finish choice in the 'note to shop'. 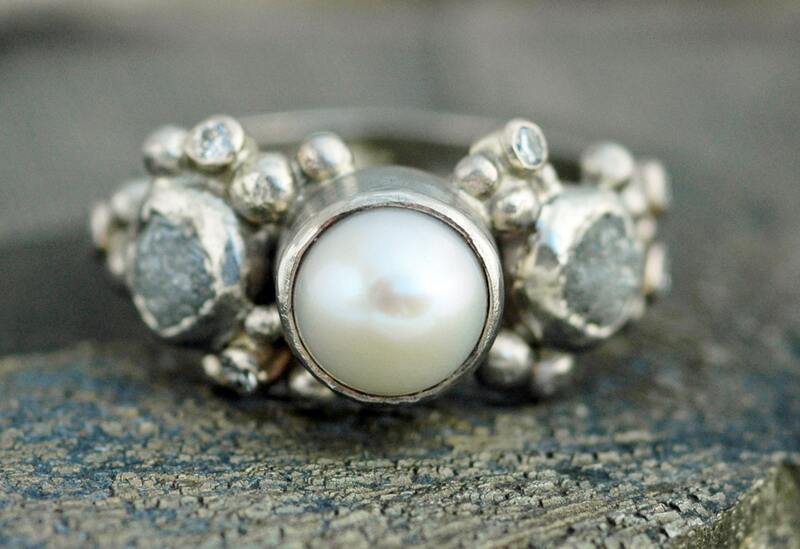 White gold- I never apply rhodium plating to my rings, as is found in many commercially-made pieces. The plating wears off, needs to be re-plated regularly, and hides the gorgeous warm colour of the white gold.